“In the Bible Adam, Eve, Cain,Abel were the only ones in the world. 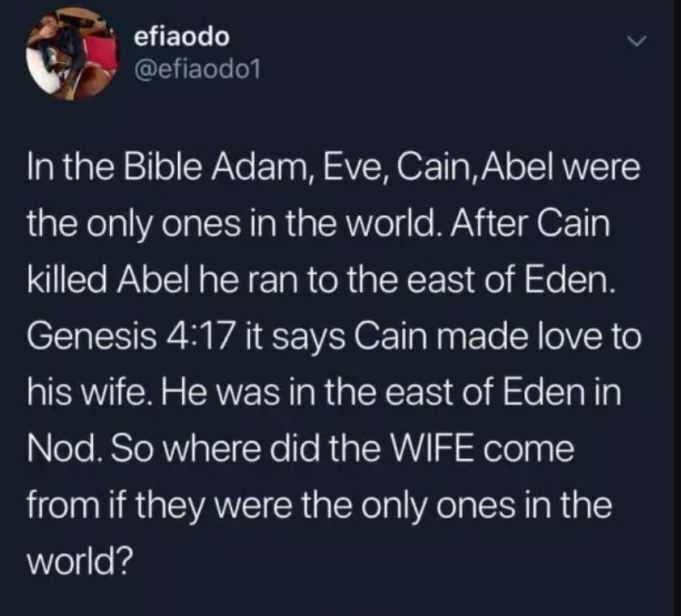 After Cain killed Abel he ran to the east of Eden. Genesis 4:17 it says Cain made love to his wife. He was in the east of Eden in Nod. So where did the WIFE come from if they were the only ones in the world?”, she asked. The man replied: “His sister. They married their sisters back in the day. 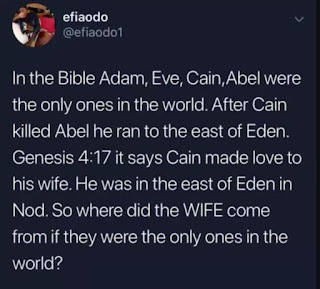 The way the bible puts it before Cain killed Abel he might have already been married to his sister. Like I said earlier, everyone on the earth was related the reason why Cain was afraid that one of his brothers would avenge”. Well then tell the Christians that. They believe it’s actual things that happened and not just a faith building storybook.